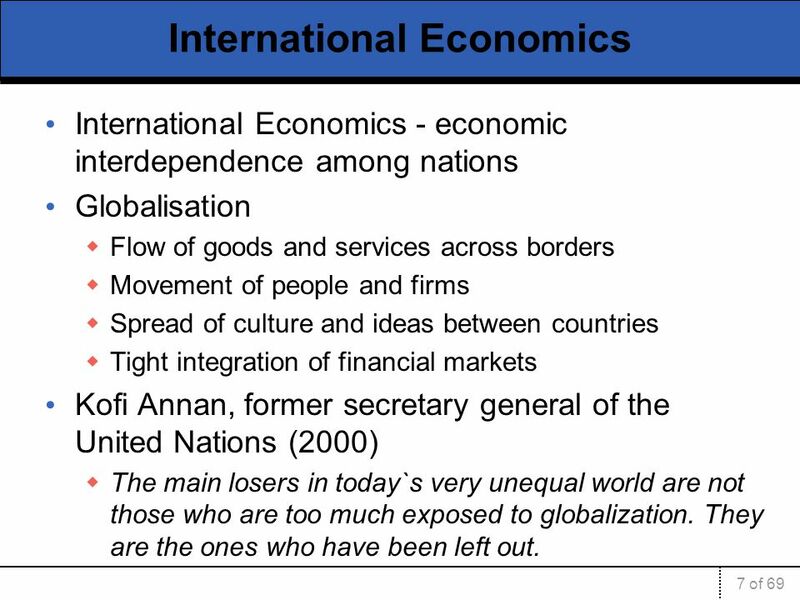 International Economics - economic interdependence among nations Globalisation Flow of goods and services across borders Movement of people and firms Spread of culture and ideas between countries Tight integration of financial markets Kofi Annan, former secretary general of the United Nations (2000) The main losers in today`s very unequal world are not those who are too much exposed to globalization. They are the ones who have been left out. Why do countries trade? They can get products from abroad cheaper or of higher-quality than those obtained domestically. The fact that Germany is among he largest exporter of goods shows its technology for producing high-quality manufactured goods. China produces goods more cheaply than most industrialized countries. 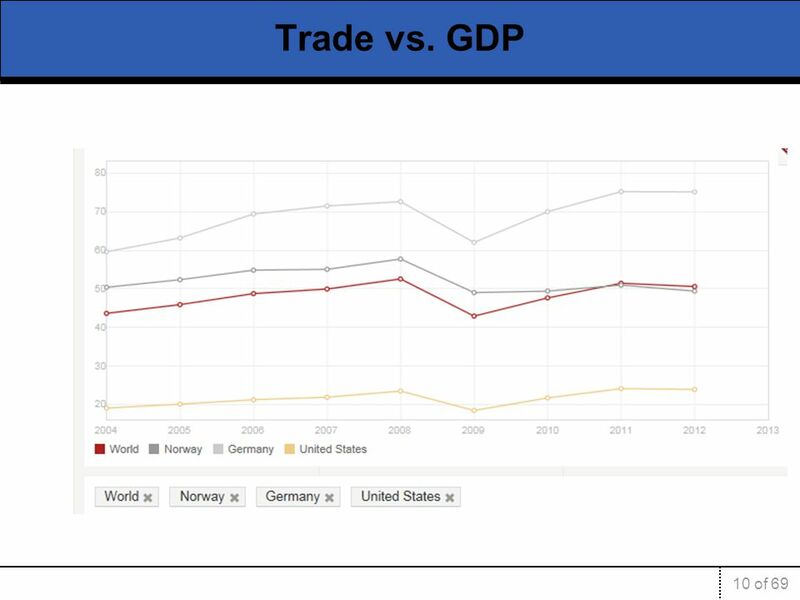 In the first part of the course, we will examine several models explaining international trade How do we measure the volume of trade? Bilateral trade flows can be hard to interpret Another way to measure trade is by looking at its ratio to GDP. 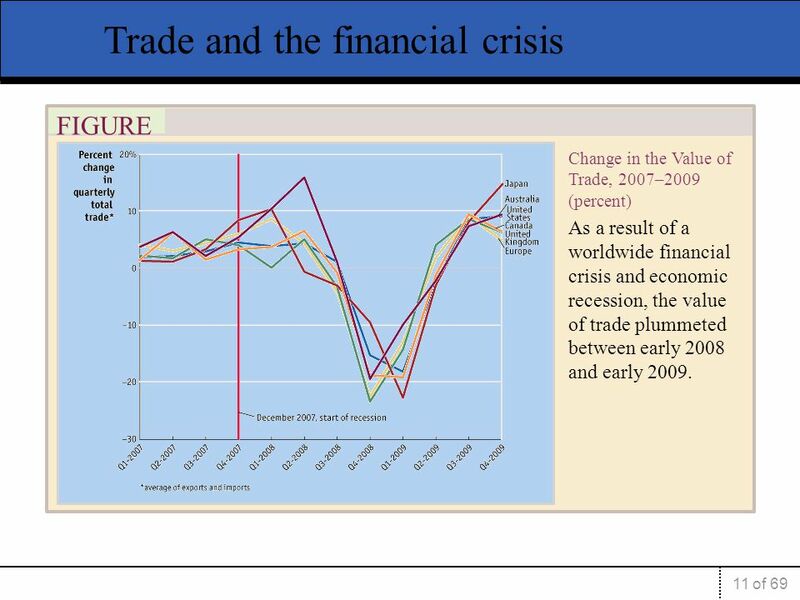 FIGURE 1-5 Change in the Value of Trade, 2007–2009 (percent) As a result of a worldwide financial crisis and economic recession, the value of trade plummeted between early 2008 and early 2009. 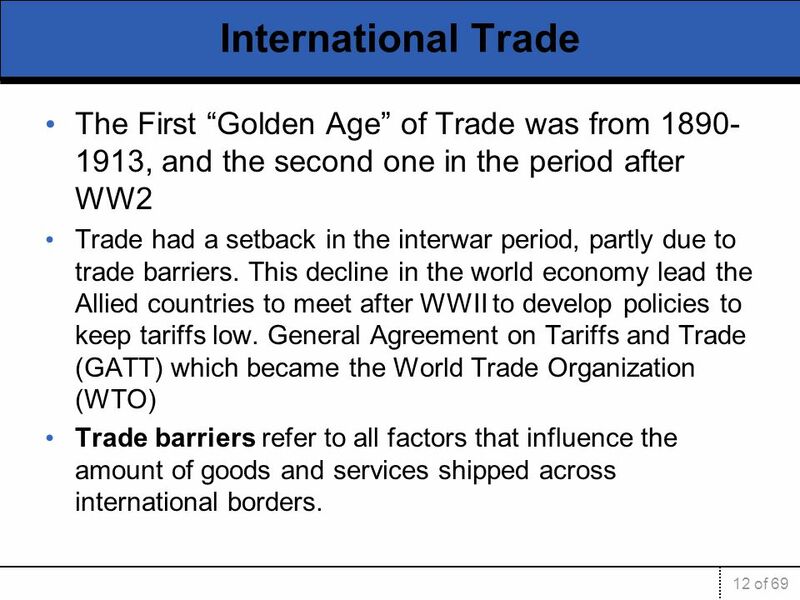 12 International Trade The First “Golden Age” of Trade was from , and the second one in the period after WW2 Trade had a setback in the interwar period, partly due to trade barriers. 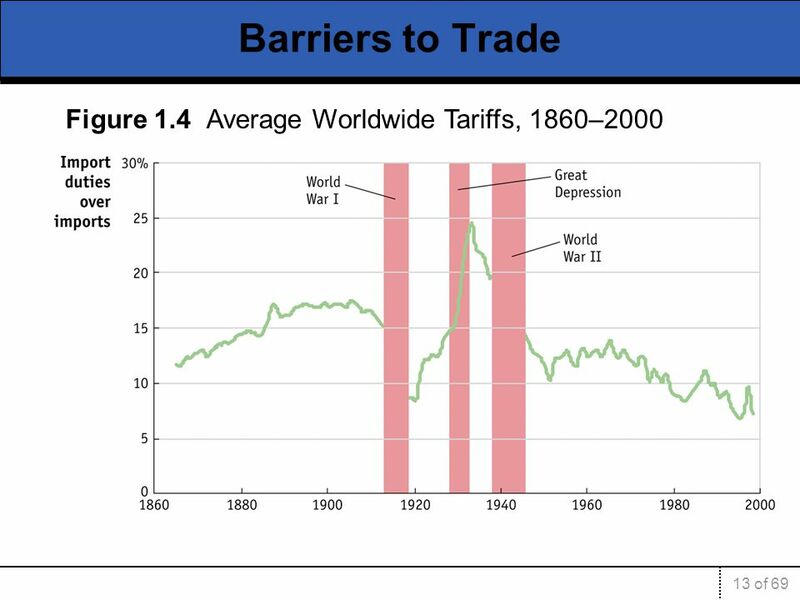 This decline in the world economy lead the Allied countries to meet after WWII to develop policies to keep tariffs low. General Agreement on Tariffs and Trade (GATT) which became the World Trade Organization (WTO) Trade barriers refer to all factors that influence the amount of goods and services shipped across international borders. Figure 1.4: Average Worldwide Tariffs, 1860–2000 This diagram shows the world average tariff for 35 countries from 1860 to The average tariff fluctuated around 15% from 1860 to After World War I, however, the average tariff rose sharply because of the Smoot-Hawley Tariff Act in the United States and the reaction by other countries, reaching 25% by Since the end of World War II, tariffs have fallen. Source: Michael A. Clemens and Jeffrey G. Williamson, 2004, “Why did the Tariff-Growth Correlation Change after 1950?” Journal of Economic Growth, 9(1), 5–46. 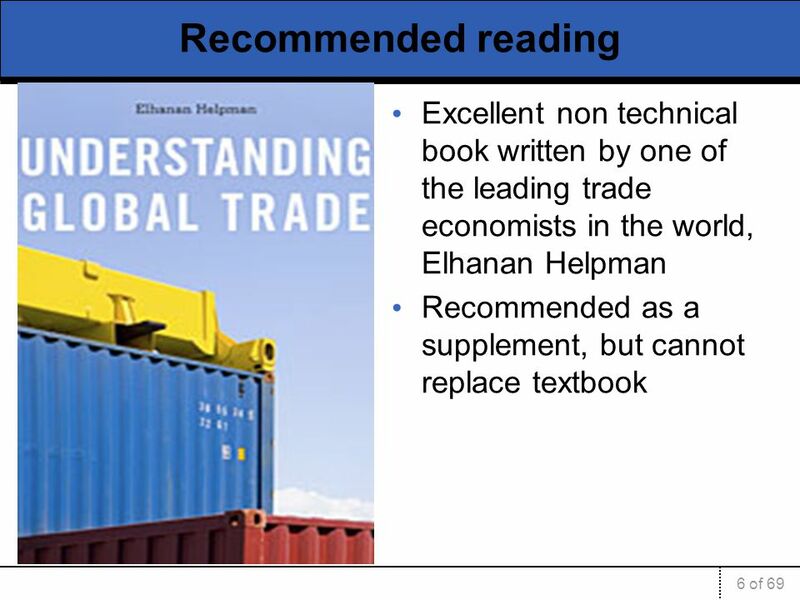 ©2013 Cengage Learning. All Rights Reserved. May not be scanned, copied or duplicated, or posted to a publicly accessible website, in whole or in part. 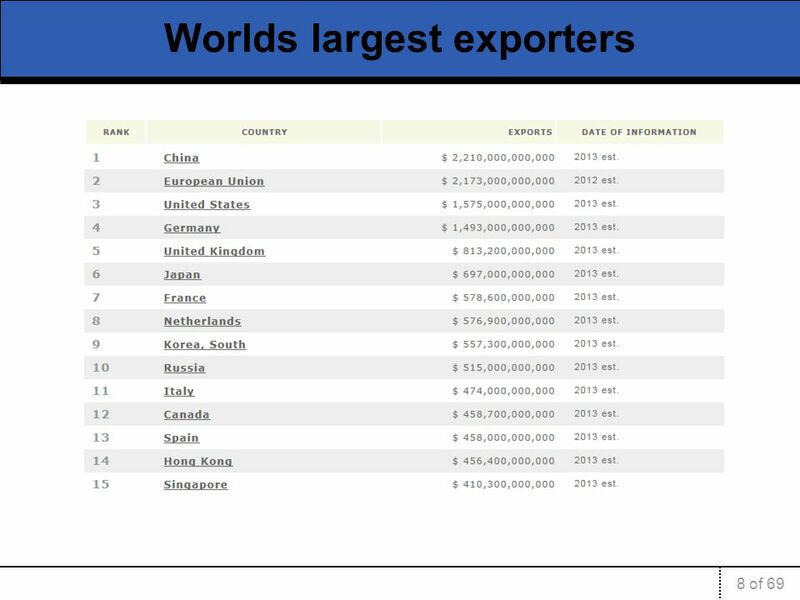 The World Economy: International Trade by Yarbrough & Yarbrough Copyright © 2003 South-Western/Thomson Learning Original PowerPoint Presentation Slides. Chapter 1 The United States in a Global Economy. 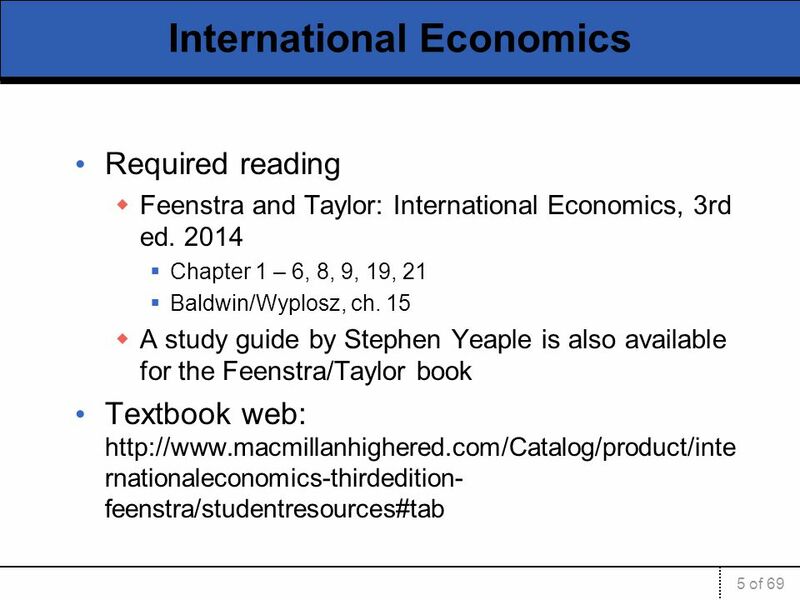 Copyright ©2014 Pearson Education, Inc. All rights reserved.1-2 Learning Objectives Explain how economists. 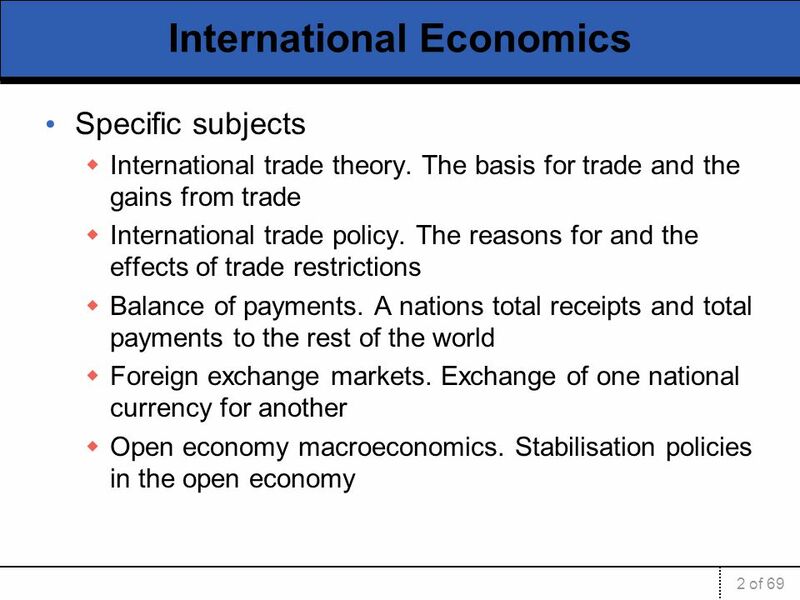 Splash Screen Chapter 17 International Trade 2 Chapter Introduction 2 Chapter Objectives Explain the importance of international trade in today’s economy. 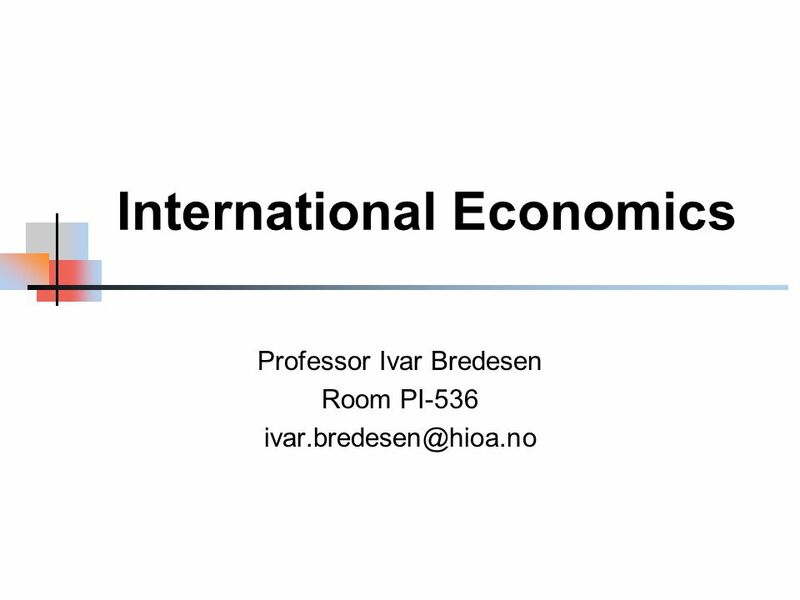 Slide 2-1 Introduction Economics 337: The World Economy. Extremely Competitive Markets Part 2: Open Economies. 1 INTERNATIONAL BUSINESS, 7e Czinkota Ronkainen Moffett. 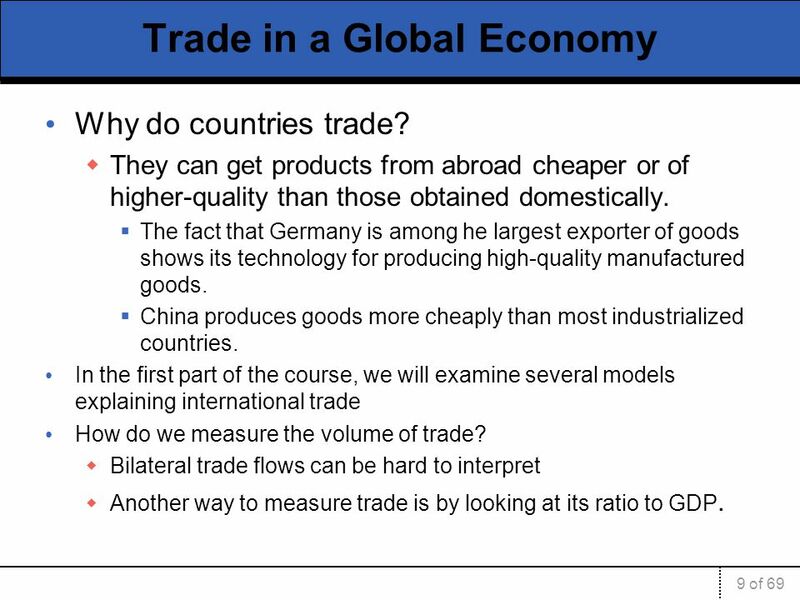 Slides prepared by Thomas Bishop Chapter 2 World Trade: An Overview. Copyright © 2006 Pearson Addison-Wesley. All rights reserved. 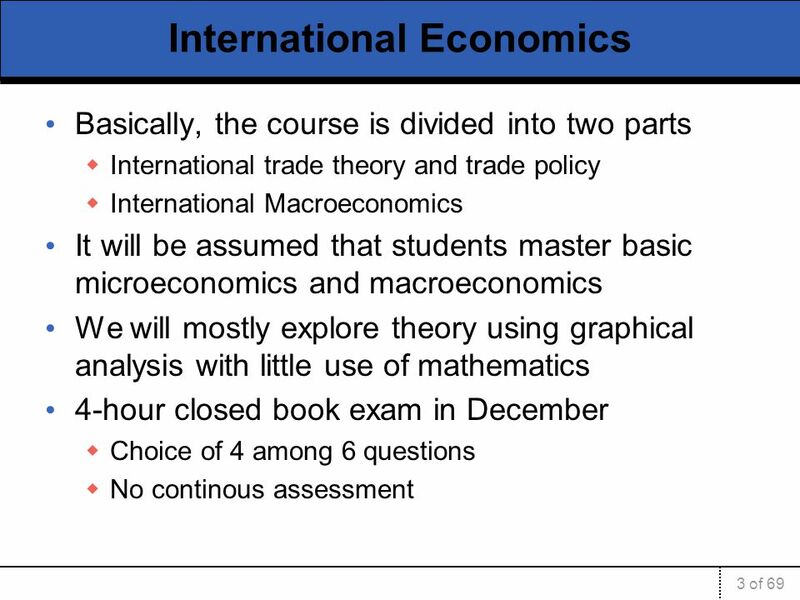 1-1 What Is International Economics About? 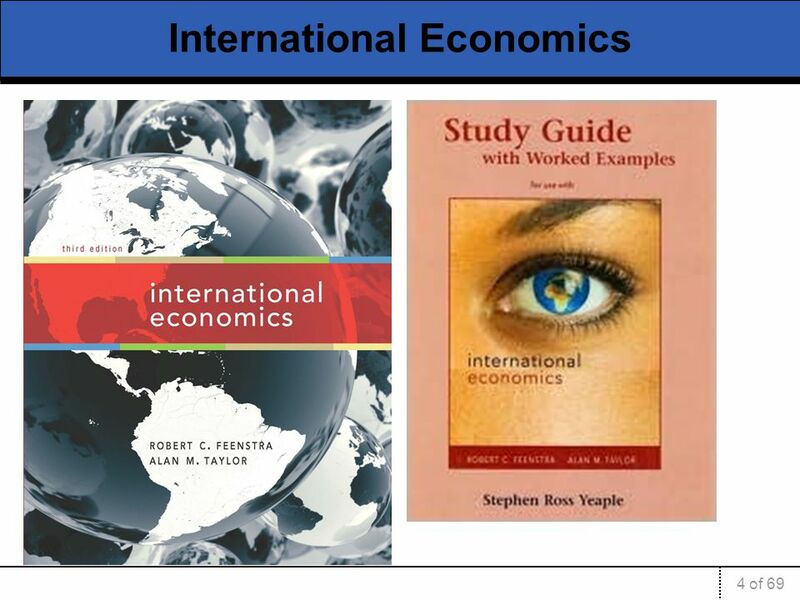 International economics is about how nations interact.